I have made Chia Pudding numerous times, yet I have not posted a recipe. 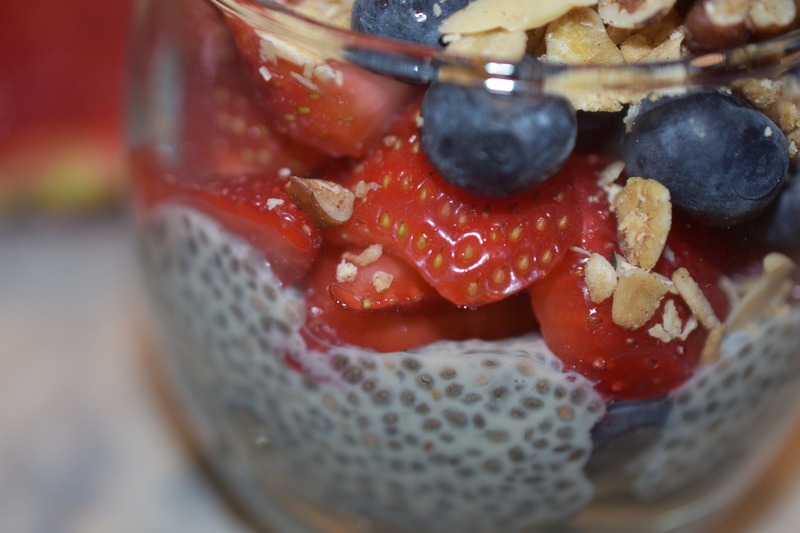 These parfaits with the Chia Pudding are great for making a large quantity. This makes 6-8 generous servings. Parfaits are great for breakfast, snacks, or even desserts. Make them in a mason jar and they are perfect for grab-n-go. Strawberries are in full season here in Florida. In our area there is a Strawberry Festival that has just started up this past weekend. There are strawberries everywhere, even in this parfait. You can use what ever fruit that is in season. That is what is nice about this parfait, it is good anytime of year. Whisk together soy milk, chia seeds, maple syrup, vanilla extract and salt. Set aside for 15 minutes. Stir chia mixture after 15 minutes. Cover chia mixture and refrigerate for 8 hours to overnight. Assemble parfaits: Blueberries, Chia Pudding, Strawberries and top with granola. I made one to eat right away in a pretty little glass and the remaining I made some in mason jars. Note: Some people do not like the texture of Chia Pudding. A remedy for that is to put it in a smoothie and blitz it all together. By this you are still getting all the fiber, protein and omega- 3 fatty acids. No wonder they call Chia seeds a super food. Thank you. I always try to have some of this made and ready in my refrigerator.